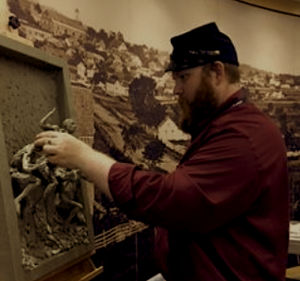 GETTYSBURG, PENNSYLVANIAL, UNITED STATES, May 15, 2018 /EINPresswire.com/ -- Invited back to Gettysburg National Military Park for the second time, artist Sean McGraw will bring his unique perspective to Gettysburg National Military Park this May & June as the Park’s featured Artist-in-Residence. McGraw is a sculptor whose visual accuracy honors the legacy of our country's most tumultuous times. His residency will take place May 15th, 2018 to June 15th, 2018, often available to the public, sculpting in the Visitor Center Rotunda on occasion throughout his residency. “The opportunity to be a resident at Gettysburg affords me a level of accuracy in subject and detail that would be difficult to obtain without working directly at the park,” said McGraw, acclaimed artist of history. McGraw received a Bachelor's of Fine Art from Savannah College of Art and Design before studying at Academy of Classical Design. Although he turned to teaching at Armory Art Center and Martin County High School in Florida, he never gave up developing his work. Eventually, the National Academy of Design in New York offered McGraw studio space. He studied sculpture, worked at a foundry, and began Historical Sculpture LLC. During his tenure as Artist-in-Residence, McGraw will work interactively with visitors by encouraging them to contribute their art and ideas to his pieces. 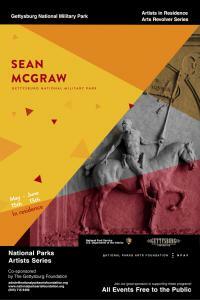 After broadening his perspective, through his first residency, this time around Sean will be focusing on WWI soldiers as well as Civil War soldiers. Being the 100th anniversary of the U.S.’s major offenses of Argonne and St. Mikiel, studying doughboys training in Gettysburg and France, will be fascinating. Through varied texture and vibrant color, he aims to memorialize the sacrifices made by our Service Members, highlighting their bravery and strength, as well as explore the themes of “Liberty and Justice for All” and embracing diversity. This Artist-in-Residency program is made possible by a joint effort of the Gettysburg Foundation and non-profit The National Park Arts Foundation, with support from the National Park Service. Through a legacy of artists, the program aims to connect visitors and the Gettysburg community to the park in a novel and compelling way, to inspire the preservation of our shared cultural heritage and the immortalization of this current point in American history. The Civil War is a fundamental piece of American History that, to modern day, displays the American ideals that this country stands. During this legendary war, the success of The Battle of Gettysburg is what led to the invasion of the North, and subsequently the surrender of the Confederacy. It was branded as the Civil Wars most gruesome battle and later facilitated Abraham Lincoln to write the time-enduring "Gettysburg Address." The idealistic park grounds house numerous statues and Civil War era pieces that immortalize the influential event. The National Parks Arts Foundation is a 501(c)3 non-profit dedicated to the promotion of the National Parks of the U.S. by creating dynamic opportunities for artworks that are based in our natural and historic heritage. The project is supported by the Gettysburg Foundation and other generous benefactors. NPAF National Park projects are supported entirely by donation and charitable partnerships. The Gettysburg Foundation supports the Gettysburg NMP program, which has become a model for artist residencies in all of the national parks. All NPAF programs are made possible through the philanthropic support of donors ranging from corporate sponsors and small businesses to art patrons and citizens- lovers of the parks. NPAF is always seeking new partners and donors for its wide-ranging philanthropic programs.